Foot and Ankle Specialists located in Sarasota, FL, Parrish, FL, & Arcadia, FL. "Dr. Cottom and his staff are very helpful and professional." "Thanks Dr. Cottom for being a great referral for a lot of our patients." "Dr. James Cottom is the absolute best." "Dr. Cottom is one of the most compassionate doctors we have ever met." "Dr. Cottom replaced my left ankle several years ago...he did a great job." "Dr. Cottom is by far the best ankle surgeon I have ever had." 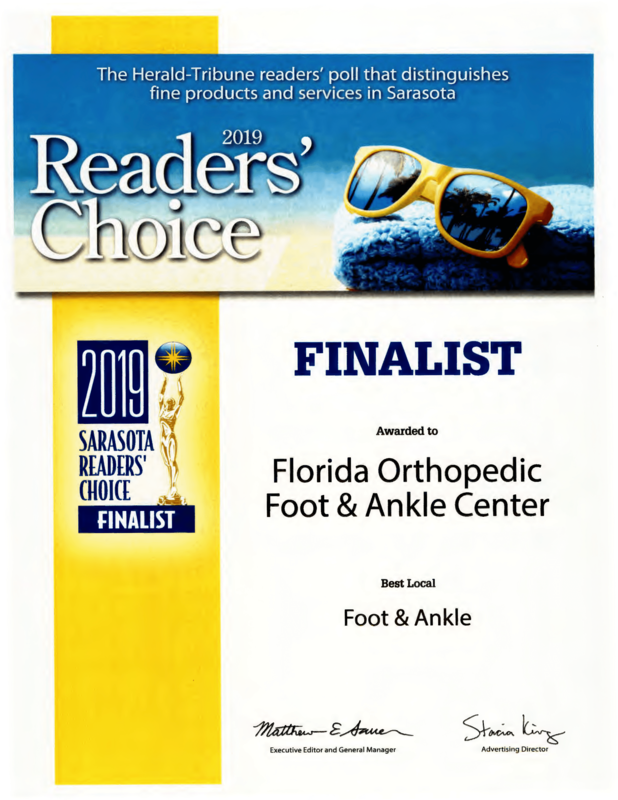 "I highly recommend Florida Orthopedic Foot and Ankle Center." "Dr. James Cottom is an amazing surgeon! Dr. Cottom is the best of the best!" "I feel Dr. Cottom is very caring and will take excellent care of me." What sets Florida Orthopedic Foot & Ankle Center apart from other practices in the area? We offer individualized, state of the art compassionate treatment. Dr. Cottom Trained on the latest Total Ankle Replacement system available in the United States by Professor Beat Hintermann MD, the designer of the implant and world renowned orthopedic foot and ankle surgeon. BALTIMORE, Nov. 8, 2017 /PRNewswire/ -- DT MedTech, LLC (DTM) today announced that the Hintermann Series H2™ Total Ankle Replacement System has received 510(k) clearance from the U.S. Food and Drug Administration (FDA). The Hintermann Series H2™ is a semi-constrained, total ankle replacement prosthesis developed by Prof. 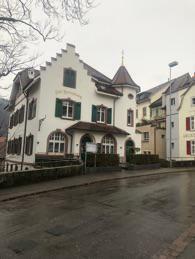 Beat Hintermann, a world-renowned foot and ankle surgeon based in Liestal, Switzerland. The Hintermann Series H2™ Total Ankle Replacement System is indicated for use with bone cement to treat ankle arthritis in either primary or revision surgery of ankle joints damaged by systemic arthritis of the ankle (e.g., rheumatoid arthritis, hemochromatosis), primary arthritis (e.g., degenerative disease), and secondary arthritis (e.g., post-traumatic, avascular necrosis). The Hintermann Series H2™ is also indicated for patients with a failed total ankle replacement or non-union/mal-union of the ankle arthrodesis, provided that sufficient bone stock is present. The Intellectual Property of the Hintermann Series H2™ is protected by numerous patents with additional patents pending. DTM continues to market and distribute its Hintermann Series H3™ mobile-bearing Total Ankle Replacement System outside of the United States in over 30 countries. The Hintermann Series H3™ is a substantiated leader for the international ankle replacement market with more than 17 years of proven clinical efficacy outside of the United States. Prof. 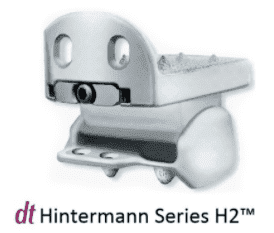 Beat Hintermann, developer of the Hintermann Series™ Total Ankle Systems, stated, "I am looking forward to adding the H2 as a semi-constrained option for my patients alongside the H3* mobile-bearing prosthesis. With the addition of the new H2 prosthesis, I will be able to expand my indications and patient selection for total ankle replacements." Dr. Hintermann going through the surgical technique and case examples (Right). Dr. Hintermann training Dr. Cottom on the implantation of the H2 total ankle (Left). 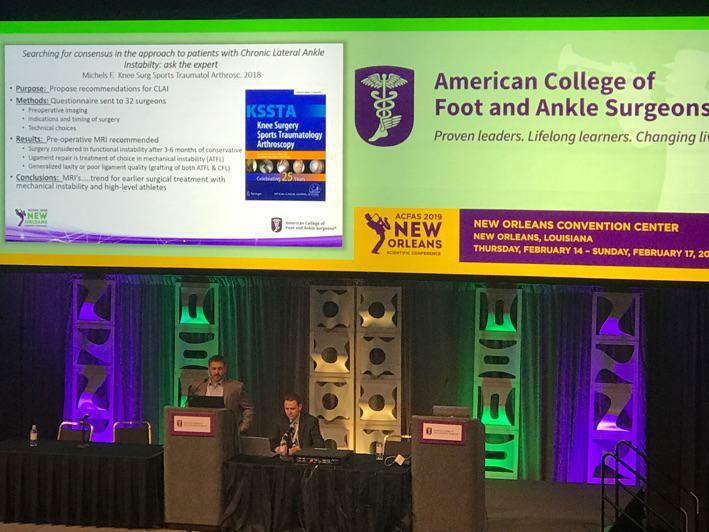 Dr. Cottom spent February 13-17, 2019 in New Orleans, LA at the 77th Annual American College of Foot & Ankle Surgeons annual meeting. This is the annual meeting where over 2,000 foot and ankle surgeons from around the world attend to learn the latest on advanced non-surgical and surgical options to treat patients. 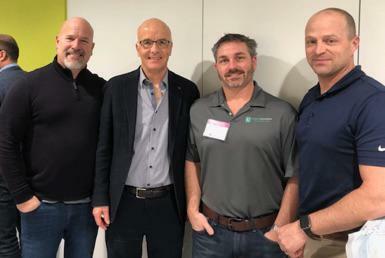 He was given the honor of giving lectures on Endoscopic Plantar Fascia Debridement, treatment options for chronic lateral ankle instability as well as complications of total ankle replacement. In addition, FLOFAC presented 5 research posters and one oral manuscript at this premeire meeting for foot and ankle surgeons. Several of Dr. Cottom’s past fellows gave lectures and presented their research at this meeting demonstrating FLOFAC’s commitment to research and obtaining the best possible functional outcomes for patients. Complications of Total Ankle Replacement / Medial Malleolar Fractures. American College of Foot & Ankle Surgeons 77th Annual Meeting. February 16, 2019. New Orleans, LA. Do We Need to Repair the CFL? American College of Foot & Ankle Surgeons 77th Annual Meeting. February 15, 2019. New Orleans, LA. Endoscopic Plantar Fascia Debridement. American College of Foot & Ankle Surgeons 77th Annual Meeting. February, 14 2019. New Orleans, LA. Regenerative Medicine in the Lower Extremity. February 13, 2019. New Orleans, LA. American College of Foot & Ankle Surgeons 77th Annual Scientific Meeting. Evaluation of BMI with an All Inside Arthroscopic Brostrom Procedure. American College of Foot & Ankle Surgeons 76th Annual Scientific Meeting. 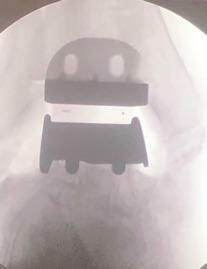 Treatment of Lisfranc Injuries using Interosseous Suture Button: A Retrospective Review of 104 Cases. Dr. Cottom on the podium speaking on Chronic Lateral Ankle Instability at the ACFAS 77th Annual Surgical Meeting in New Orleans, LA. Dr. James Cottom attended a two-day intensive course on advanced total ankle replacement in Liestal, Switzerland. This meeting was attended by orthopedic surgeons from all over the world and was organized by Prof. Beat Hintermann. Dr. Cottom was the only surgeon from the United States to attend this prestigious event. 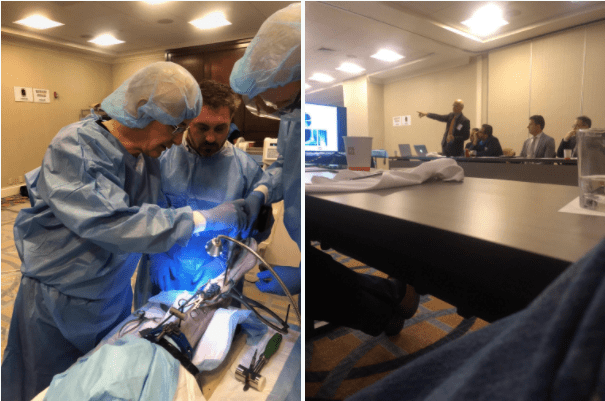 The course concentrated on advanced treatment options with total ankles, revision implant cases and correction of major deformities of the lower extremity and the impact on total ankle replacement. This was truly a once in a lifetime opportunity and Dr. Cottom is proud to bring back the techniques he learned and be able to offer these to his patients in the United States.